All of these verbs are euphemisms for one word – nosh. We all like to nosh. In fact noshing is among my favorite pastimes. It’s probably among yours. The kind of noshing I like to do transcends the usual suspects – you know Lays potato chips and mini Snickers bars. Instead, I like to make noshing an experience, an adventure, an indulgence and a special treat for me or for a few invited guest, s or that special guest – if you know what I mean. Nosh boards are the perfect appetizer display. Fill them with raw, roasted or candied nuts, sliced cheese and dried fruit. Or make the board more like a meal with grilled chicken slices, assorted olives, brie or cheese spread, sliced artisan breads, fresh fruit, raw vegetables and dark chocolate covered walnuts. How about chocolate covered strawberries, smoked gouda, smoked salmon, oven roasted vegetables (broccoli, potatoes, carrots) and assorted crackers and breads. Don’t limit yourself. Add a small ramekin or bowl and fill it with tapenade, tuna, humus, salsa – you get the idea. Try your hand at a nosh board. It would be perfect for your Easter or Passover dinner, next gathering with friends, or an evening with that special someone. It’s simple yet simply good. And guys, you can try this one at home too. Start with a small cutting board, perhaps one you may have in your kitchen – yes a cutting board. The one featured here is approximately 10 x 9 inches but you can use any size you want. Wrap the board with good parchment paper (using the modifier “good” makes me think of Ina Garten when she says use good olive oil or good vanilla). I used PaperChef Parchment Sheets. The precut 38 x 42 inch sheets have really cool embossed watermarks that have look and feel of specialty paper. You can tape the paper to the back of the board; or tuck the ends underneath or leave them free. I simply tucked the ends underneath my board. 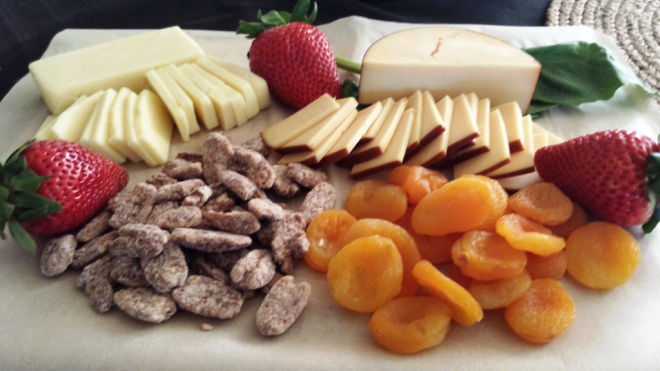 Next, place a variety of food items on your board, arrange them as you please. Be playful, whimsical and creative with the composition. There are no rules here. Then – nosh away! This entry was posted in Foodies and tagged appetizers, bread, cheese, chicken, crackers, cutting board, Easter, gouda, nosh, nuts, olives, party, Passover, salmon, strawberry. Bookmark the permalink.